Looking up at the sky is an action that has many meanings: dreaming, researching, relaxing, wishing, enthusiasm, hope, love, concern or, what I like best, adventure. There are literally thousands, many thousands of aircraft flying across the sky every day. Thanks to those aircraft, we travel and transport goods to anywhere in their world. And thanks to satellites, which are much further away, we can send messages from a mobile phone, connect to the Internet in remote areas, know our position, see our home on Google Maps or find out about next week’s weather. All these aircraft move along specific orbits at different altitudes, which helps them to be much more organised than what we would initially think. 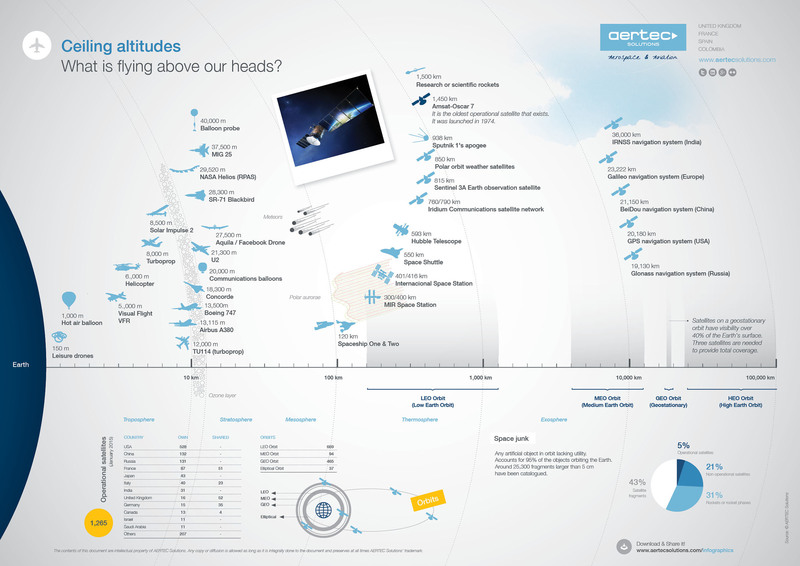 Groups of aircraft are concentrated in some orbits, while others are almost empty. However, not everything that shines in the sky is useful. There are also objects up there which are not aircraft: space junk. There are more than 8,000 rocket remains, disused satellites or bits of them that are still up there. This infographic shows the most important or famous aircraft that overfly our planet or have done so in the past, so we can make sense of that enormous sky we have above us in a glance. Enjoy it and, if you like it, share it.